I tend to wing it with breakfasts and make whatever I think of in the morning. 1. Porridge. This is super easy because I just pour all the ingredients into our Thermomix and it does the rest. S eats this one. 3. Scrambled eggs with diced bacon stirred through. S and sometimes J will eat this. Not L.
4. 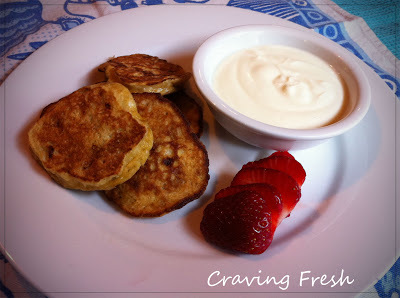 Banana coconut pikelets. Everyone likes these, most of the time. 5. Vanilla or chocolate smoothies. S likes vanilla, L and J like chocolate, so I start off by making a vanilla smoothie and pour out a serve of that for Sophie and then I add a Tablespoon of cocoa (and sometimes a teaspoon of Maca powder) to make it chocolate for the other two. Reminds me my kids all over again....and now my grandkids but as I only have them now and again I don't mind doing five different breakfasts. Nana can spoil....as long as they have the patience!